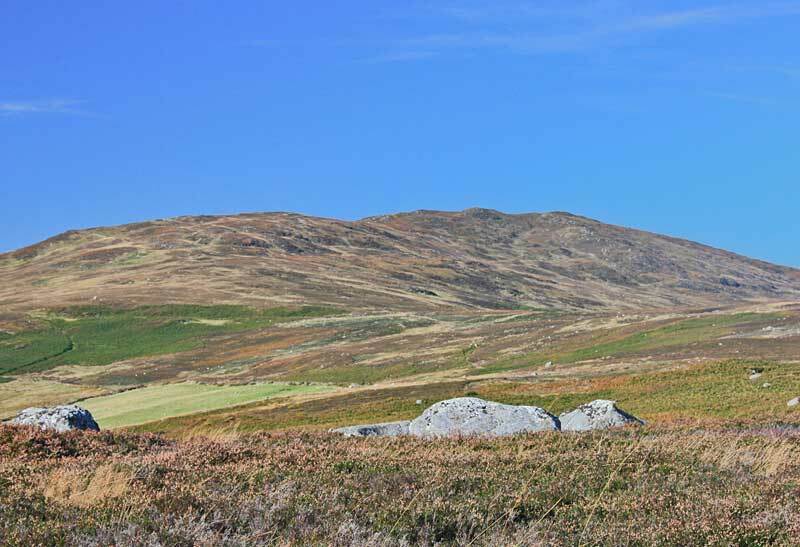 Picture from group : Scarr from the SE. Picture: Scarr from the SE. Three ridges, many routes and good views. Scarr has three useable ridges off it, to the north, south and east. The easiest perhaps is the Glenmacnass Waterfall carpark O11380 03009 A (notorious for break-ins). From here head for the north ridge that extends from Scarr to Kanturk (aka Brown Mountain). Round trip around 90-100 minutes. Another starts from Oldbridge O1581 0197 B. From the east of the public road there is a well surfaced track that leads steadily uphill past farms and several new houses. Follow this until the point where it swings sharply left and leave it to head through a gateway straight ahead onto a grassy boreen that leads onto the lower slopes of Scarr. From the south at T14021 97510 C there is a small carpark. (This is a useful also because there is a bridge allowing access to the Brockaghs area here) Head up via forest tracks and a path up the southern ridge of Scarr, marvelling that such a small summit can have so many false tops. Other routes from the north come via Knocknacloghoge or the track around the north side of Lough Dan.